Before starting the game, you can choose a character class and a burial gift, and modify your characters appearance should you choose to. 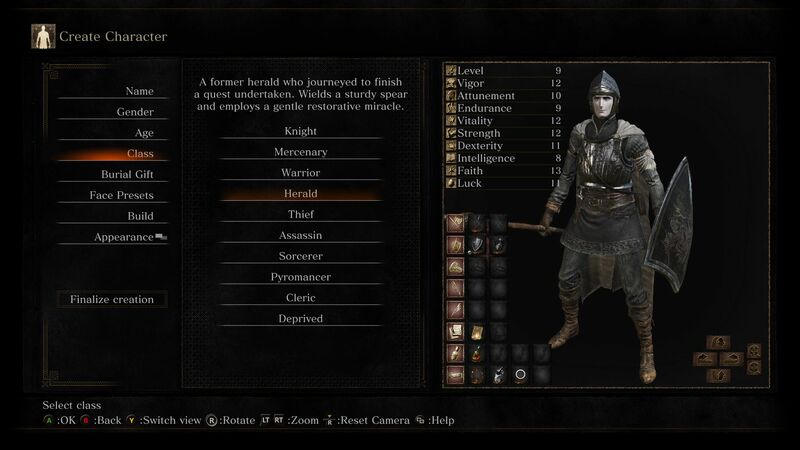 While you are free to level up your character however you want later in the game, the starting class and items may provide advantages based on your playstyle. The stats of the classes also give you an idea of what to put points into later in the game should you choose to build up on that class. Vigor: Determines your HP. Get some early points in to survive more punishment. Attunement: Determines how many spells you can equip at a time and the amount of Focus Points you have which is needed for performing spells and Weapon Arts. Important for Sorcerers, Pyromancers, and Clerics. Endurance: Determines the amount of stamina you have. Soft capped at 40, so it’s unwise to level past 40. Vitality: Determines how much load your character can carry and poison resistance. Also improves physical defense. Useful if you want to equip heavier armor. Strength: Needed to use heavy and powerful weapons. Increases damage for weapons that have Strength scaling. Soft capped at 40, then at 59. Dexterity: Needed to use advanced weapons. Increases damage for weapons that have Dexterity scaling. Reduces spellcasting time and fall damage. Soft capped at 40, then at 59. Intelligence: Needed to cast sorcery and pyromancy spells and determines effectives of sorcery, dark miracles, and pyromancy. Boosts Magic defense. Increases damage for weapons that have Intelligence scaling. Soft capped at 40, then at 59. At 50 Intelligence, you can cast every Sorcery spells in the game. Faith: Needed to cast miracles and pyromancy spells and determines effectives of miracles and pyromancy. Boosts Magic defense. At 45 Faith, you can cast every Miracle spells in the game. Luck: Increases the chance of enemies dropping multiple items upon death. Improves resistance to curses. Increases speed at which bleeding and poison stats are applied on enemies. Knight: "An obscure knight of poor renown who collapsed roaming the land. Sturdy, owing to high vitality and stout armor." The Knight is a good choice if you are new to the Dark Souls series or want a class that can wear heavy armors and is decently geared from the start. The first part of the game is easy for a Knight thanks to its high defense. Mercenary: "A mercenary and veteran of the battlefield. High dexterity allows masterful wielding of dual scimitars." Another good choice for beginners. The mercenary has the highest dexterity among the starting classes and comes equipped with dual wield weapons. They also have a shield they can use should the need arise. If you like to attack fast, mercenary is a fun class to play. Warrior: "Descendant of northern warriors famed for their brawn. Utilizes high strength to wield a heavy battleaxe." Warriors will hit slow but hard from the start thanks to their high strength value. If you want to take down enemies with an axe and deal big damage, warrior should be your pick. Herald: "A former herald who journeyed to finish a quest undertaken. Wields a sturdy spear and employs a gentle restorative miracle." If you prefer a more defensive playstyle, the Herald provides good sustain thanks to early access to Heal Aid miracle. They also come equipped with a spear that allows them to poke enemies from a decent range and a shield that can absorb physical damage. Thief: "A common thief and pitiful deserter. Wields a dagger intended for backstabs alongside a military-issue bow." Thieves maneuver in and out of battle fast with their daggers and have access to a bow from the start. However, until you get to the Firelink Shrine, your arrows will be limited. They also have a high amount of Luck stat, which allows greater chance of item discovery. Assassin: "An assassin who stalks their prey from the shadows. Favors sorceries in addition to thrusting swords." If you prefer a sneakier style of gameplay, the Assassin is a good choice. They are excellent at close combat thanks to the Estoc and also adept at casting sorcery. With the Spook spell, Assassins can sneak up on enemies easily and also avoid fall damage. 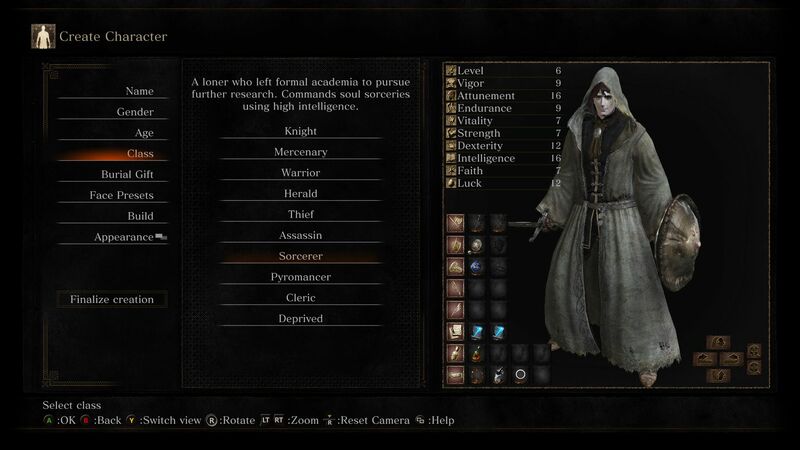 Sorcerer: "A loner who left formal academia to pursue further research. Commands soul sorceries using high intelligence." Even though their starting level is only 6, sorcerers can cast powerful spells from the start. Later in the game sorcerers can pack a lot of damage and can be really strong, so if you prefer a spellcaster class, Sorcerer is what you want. 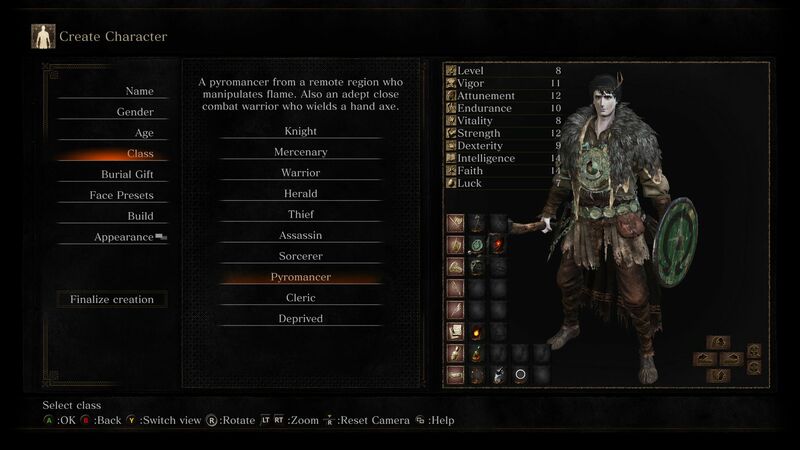 Pyromancer: "A pyromancer from a remote region who manipulates flame. 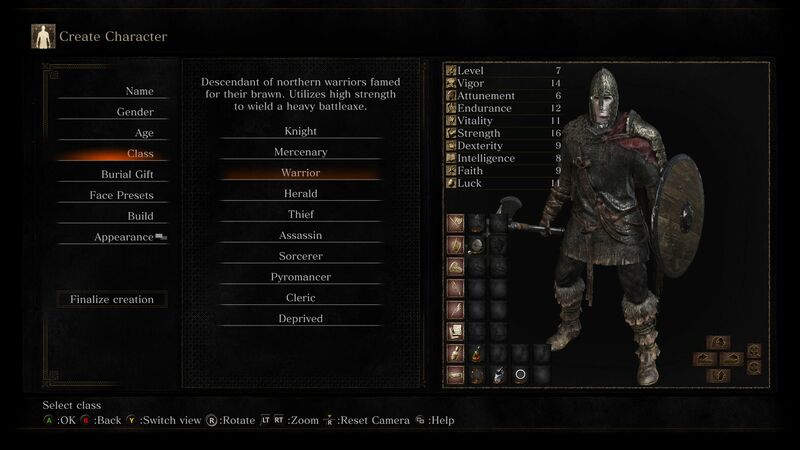 Also an adept close combat warrior who wields a hand axe." Unlike Sorcerers, Pyromancers are excellent at close combat on top of being able to cast sorcery spells and later on pyromany spells. There are many enemies in the game that are vulnerable to fire, including the first boss, so Pyromancers excel at taking out those enemies. Cleric: "A travelling cleric who collapsed from exhaustion. Channels high faith to cast many and varied miracles." Cleric is another magic based class who uses primarily miracles for buffs and heals. Their defense is low, but they make up for it with their mobility. It’s not an easy class to play and will require good dodging skills. Deprived: "Naked and of unknown origin. Either an unfathomable fool in life, or was stripped of possessions upon burial." 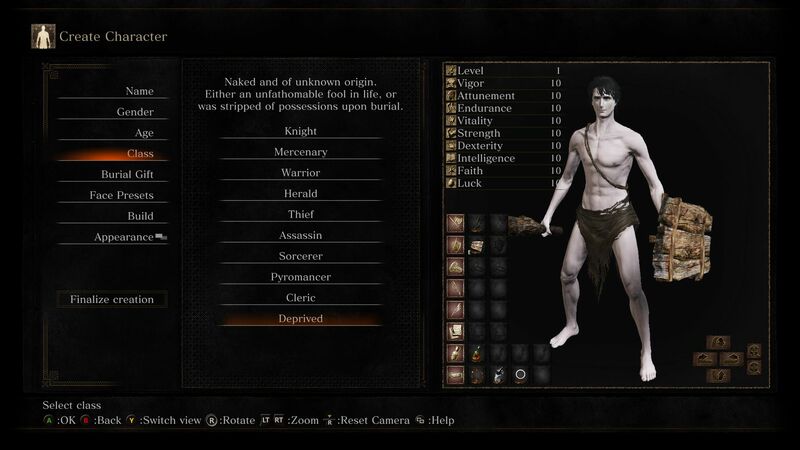 Choose this class only if you’re an experienced Dark Souls player and want more challenge. This level 1 class has very low defense, is barely equipped, but provides the freedom to level up your stats however you want. Life Ring: "Ring set with a small red jewel. Raises maximum HP." Good for classes with low HP. Divine Blessing: "Warm, blessed holy water. Full restores HP and cures ailments." A backup item in case you run of Estus Flasks to use. Hidden Blessing: "Pure, blessed holy water. Fully restores FP." (FP enables each weapon's unique Arts attack) This is good for spell caster classes. Black Firebomb: "Firebomb charged with a special black powder. An uncouth gift for the departed." Useful for the first boss fight Iudex Gundyr. Fire Gem: "Material used to upgrade to fire weapons. More appropriate for a warrior than pretty trinkets.” You can infuse this into your item to add fire damage after you reach Firelink Shrine. Sovereignless Soul: "The sovereignless soul of one who slept beside you. Use to acquire many souls." If you want to gain a level fast, this is a good choice. Talk to the Fire Keeper at Firelink Shrine to level up. Rusted Gold Coin: "Burial item for good fortune after death. Greatly increases item discovery for a short while." This is useful when you are farming for items. Not a top priority choice early in the game. Cracked Red Eye Orb: "Online play item. One use only. Become a dark spirit and invade another world." If you love PvP, you’ll need this to invade another player’s world. Young White Branch: "Branch of a young white birch, perhaps an offering of peace. Can be used to blend into the environment, but only once." As the item description says. Not very useful to help you in the earlier parts of the game.